Welcome back to another day of Blogmas! Today, we're tackling the differences of Christmas in Australia vs Christmas in the US. Often, being away from family during the holidays can make Christmas feel a little less magical. Sometimes, homesickness can rear its ugly head when one experiences subtle differences in how holidays are celebrated. This will be my 4th or 5th Christmas in Australia, and throughout the years, I've noticed some subtle and not so subtle differences in how Australians celebrate Christmas. Here are the five most significant differences between Christmas in Australia and Christmas in the USA. In the US, Christmas dinner is a huge staple in many family's traditions in celebrating Christmas. Feasts similar to Thanksgiving are prepared and enjoyed by the family. Turkey, ham, green bean casserole, pumpkin pie, chocolate mud pie, and other goodies are served for everyone to enjoy. We usually spend the mornings with our immediate family (mum, dad, siblings) and later treck over to another family members house to enjoy Christmas dinner. Some families celebrate their Christmas dinner on Christmas Eve. No matter the day celebrated, it is rare that you'll find a family that celebrates a Christmas lunch. However, in Australia, many families celebrate with a Christmas lunch. Instead of a turkey, feasts consist of seafood and prawns, maybe some bbq food, and pavlova for dessert. As the weather is entirely different to that in the Northern Hemisphere, many families enjoy their Christmas lunch outside. Many of my friend's families actually go to the beach for Christmas lunch. Both Christmas lunch and dinner have their positives and drawbacks. I've begun to notice that the reason Aussies may not make a Christmas dinner is because of the excellent weather and the fact they're slightly less religious than in the US. Many families in the US will go to church on Christmas Day so a lunch may not be feasible. When you're looking forward to ending your day with loved ones, a Christmas lunch can be a little bit of a letdown. In Australia, they hold Carols by Candlelight. This has been a huge tradition in Australia for roughly 70 years. Families and friends will gather together in a park, sing carols, and watch various performances. Vision Australia's Carols by Candlelight is the largest Carols held in Melbourne each year on Christmas Eve. While I've never attended a Carols, it is a must do Aussie Christmas tradition. In the US, they carol in a slightly different way. People will often group together and go door to door singing various Christmas songs. Everyone is bundled up nice and warm, sipping hot cocoa and spreading Christmas cheer. At school, our choir would go carolling from class to class. My family would sometimes carol around the neighbourhood. It was always a great way to create a sense of unity and peace in an area. Plus singing Christmas songs is always a good time! Try not to smile singing "Grandma Got Ran Over By a Reindeer". I've really struggled with this since moving to Australia. Yes, there are some areas where people decorate their houses with lights and other decorations. However, I've found, for the most part, this is not the case. Back homes, various neighbourhoods enforce their occupants to decorate for Christmas. And not just string a thing of lights up decorate, I mean full out, put some of those Youtube videos to shame. I get that it's not everyone's cup of tea and not every family celebrates Christmas, but it would be nice to see a little more holiday cheer in Australia. The shops sure do an excellent job of shoving it down your throat here. Back home in the US, many families adorn their houses with nativity sets. In my house, we were not allowed to display the Baby Jesus in the nativity set until Christmas day. Each year, we would fight over who would be the one to place him into the nativity. All my friends also had various nativity sets in their house. To be fair, I grew up in a Catholic household with most of my close friends coming from a Catholic background. This may not be the case for most of the US, but in my collective circle, everyone did. Along with our advent calendars, we anxiously counted down the days until Christmas. Christmas in Australia definitely has a more laid-back vibe. In combination with the excellent weather and the chilled nature of most Australians, it's no wonder that Santa would also be a bit more relaxed in his holiday festivities. Before Santa delivers all the toys to the good little boys and girls of the world, he takes a quick holiday and surfs on Christmas Eve morning. Honestly, this is probably the coolest Christmas tradition I've ever heard. I'm all for Santa taking a holiday and surfing before going to work. This should be a pronounced difference in celebrating the two. Australia is in the Southern Hemisphere so during December it's warm and sunny. There is no such thing as a white Christmas in Oz (unless Tassie gets the odd snowstorm). I grew up almost always experiencing a white Christmas. My granny's house was in the middle of BFE Michigan and was the closest thing to a real-life Disney movie one could get. It was picturesque, with the house blanketed in white, fluffy snow. You would see deer running through the snow-covered meadow throughout the day. Our family, running and yelling throughout the house. It was a blessed miracle no one perished during our family Christmas'. 35+ people packed into one house. That's the beginning of a horror movie. Here in Australia, we're greeted with warm sunny days, sand castles instead of snow angels, and a generally more pleasant mood because people aren't about to lose a toe due to the cold. Overall, the differences between celebrating the holidays in Australia and the US are not that different. I guess it boils down to whether or not you're celebrating the holiday with people you care about. It can be challenging celebrating the holidays in a different country. What are some of the Christmas traditions in your country? Have you ever celebrated the holidays in a different country? How did you fair? If you missed out on day 1, be sure to go back and read it! It will help you come up with awesome gift ideas for anyone you know that loves to travel! I learned about Christmas at the beach from a classmate, back in elementary school. It seemed very bizarre to me at the time, but these days I think it might be fun to give it a try at least once. I wonder if the lack of lights has something to do with the fact that in the southern hemisphere, Christmas occurs right around the time when the days are their longest. Perhaps people aren't feeling the need for extra light and cheery decorations because there's lots of that being provided by nature? Christmas in Australia has been on my bucket list for years now. I'd love to experience Christmas in the sun seeing as it's always absolutely freezing here in Ireland. A few of my friends have done it now and I'm so jealous. 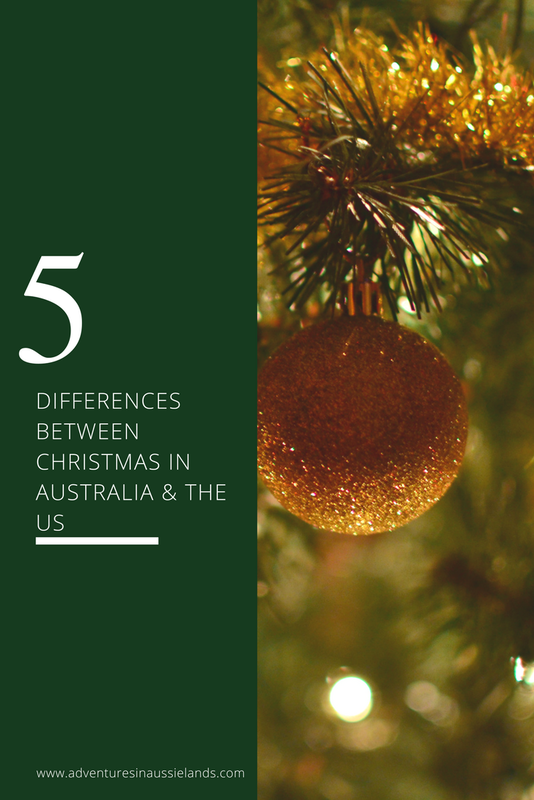 I love this posts as I love Australia and learning the differences in our celebrations of Christmas. I thought that the warm vs. cold weather would be a big deal, but I didn't know what decorating wasn't as much of a big deal in Australia. Loved your post! My husband is from California, so our Christmas dinner consists of homemade tacos (including the shell - it's homemade too!) and macaroni and cheese! The surfing Santa is so funny!!! Also I HATE seafood so I would have to go more BBQ if I was in Australia for Christmas! I'm an American living in the UK, and a friend recently went to Australia for three months. Today's photo was Elf on the Shelf in the sand at the beach! Hmm, I wonder why less decoration in Australia. Different traditions everywhere and still each festival is lovely in its own place. Where do you enjoy celebrating Christmas the most?